Having followed the water — and, in many places, found it in the form of ice — NASA's Mars focus is shifting toward environments that likely show hospitality for life, either present life or (what's far more likely) ancient, long gone life. What NASA is looking for, in a word, is habitability. This region — Hypanis Valles — was once considered a potential landing site for NASA's Mars Science Laboratory (MSL), the next-generation rover due for launch in late 2011. MSL's mission is to find and study habitable environments, old or new. Other locations beckoned more enticingly, however, and Hypanis didn't make the MSL short list. Yet it remains an intriguing place because of the thin fluvial channel that threads through the scene, plus the associated broad, bright patch in the center. Hypanis lies in Xanthe Terra, a low cratered region on the northeast side of Valles Marineris. The terrain slopes gently down into the Chryse basin, part of the vast northern lowlands. Several prominent channels slice through Xanthe, chiefly Maja and Shalbatana Valles. These are relics of the era of outflows, when a warmer and wetter Mars than today saw floodwaters as great as any on Earth or greater. The image is a mosaic of daytime infrared frames taken by the Thermal Emission Imaging System (THEMIS), a 10-band infrared and visual camera on NASA's Mars Odyssey orbiter. Sweeping around Mars with Odyssey's 2-hour orbit since 2002, THEMIS has woven a tight network of images that now completely cover the planet at 100-meter (330-foot) resolution. 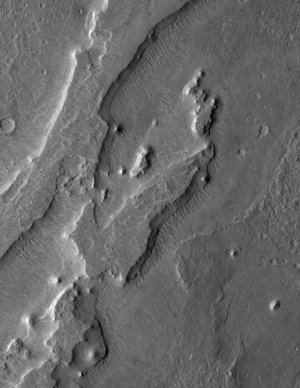 THEMIS has also imaged selected regions at 18-meter (59 feet) resolution using its visual-wavelength imager. 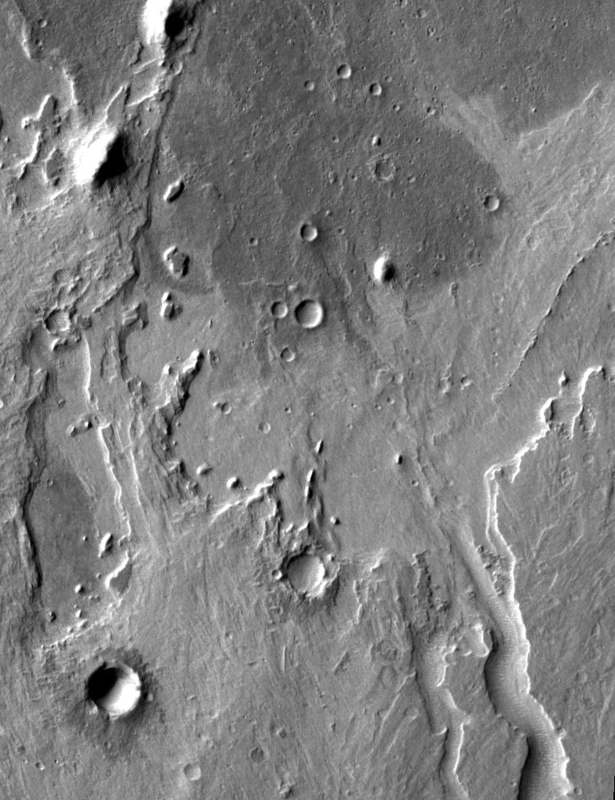 The Hypanis channel is comparatively modest, as Martian channels go: the valley is about 2 km (1.2 mi) wide and averages 100 m (330 ft) deep. The channel bed does not make a smooth descent, but rather has low spots and higher ones, plus ridges in the bed paralleling its course. (See the larger THEMIS VIS view at right.) These are probably the residue of intermittent floods that varied in strength. The meanders indicate that the ground is mostly resistant to erosion, probably being old lava flows or hardened impact debris. Streams develop meanders where their outside banks can erode slowly. This calls for a water flow that is mostly steady and not too great, and nearly flat terrain. Where water flows across soft-sediment landscapes, however, stream beds quickly widen into multiple shallow channels. 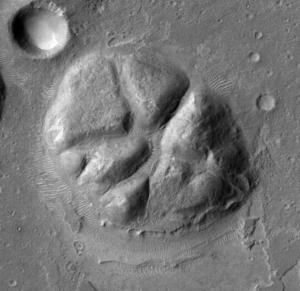 The ill-defined inner banks, seen in several places along Hypanis, suggest the stream was flowing through softer materials in those places. Such a mix of surface materials makes geological sense, given the age and heterogenous nature of Xanthe Terra. In the center of the mosaic the landing site once envisioned for MSL sits like a natural bullseye. Despite appearances, the topography of the light-toned patch does not form an actual basin, but rather a flat area some 20 to 25 km (12 to 15 mi) wide. A closer look with the THEMIS camera's visual imager (with an 18 m or 59 ft resolution) shows that the patch isn't as smooth as first glance suggests. Instead, a sheet of light material has spread across the course of Hypanis, perhaps created as water flowing downstream to the north slackened its pace and spread across the flats. The closeup view at right shows two craters that look buried to the rim-tops by this layer. At some later point, renewed flow down Hypanis poured over the light-toned layer and cut a fresh channel through it, about 10 to 15 meters deep. Toward the eastern side of the region lies a long mesa that appears to be an eroding remnant of a once-wider sheet of material. It stands about 60 meters (200 ft) high. How this mesa relates to the light-toned layer just mentioned is unclear. The closeup view at right, taken by the HiRISE camera on NASA's Mars Reconnaissance Orbiter, shows that the mesa is built from many individual layers, each perhaps 10 m (33 ft) thick. These layers may derive from repeated floods that washed debris down over the landscape. But a fluvial origin isn't the only possible source. Another could be sheets of volcanic ash settling out of the air, perhaps from explosive eruptions in the large Tharsis volcanic province to the west. Yet another source is windblown dust, perhaps compacted with ice and snow during former glacial epochs. Hypanis now lies too close to the Martian equator and hence is too warm, for ice to survive except where buried dozens of meters deep. But today's conditions didn't always hold in the past, and telltale remnants of earlier glaciers and cold periods are abundant, even at moderately low latitudes. Looking for all the world like a kaiser roll, this hill rising abruptly out of the plains could be a pingo, the geologists' term for a giant frost heave. Found commonly in the Arctic on Earth, pingos form in cold climates where water becomes confined at shallow underground depths. When the water freezes and expands, it buckles the ground upward. Adding more water adds to the ice and increases the buckling, and the pingo grows until it ceases to accumulate more ice. This Martian hill rises 150 to 200 meters (500 to 650 feet) and is about 3 km (2 miles) wide, making it large by Earth standards if it is indeed a pingo. If it isn't a pingo, then it may simply be a remnant of the mesa-forming unit that has eroded to resemble one. And another possibility is a volcanic feature — however, there's no apparent volcanic activity in this area. 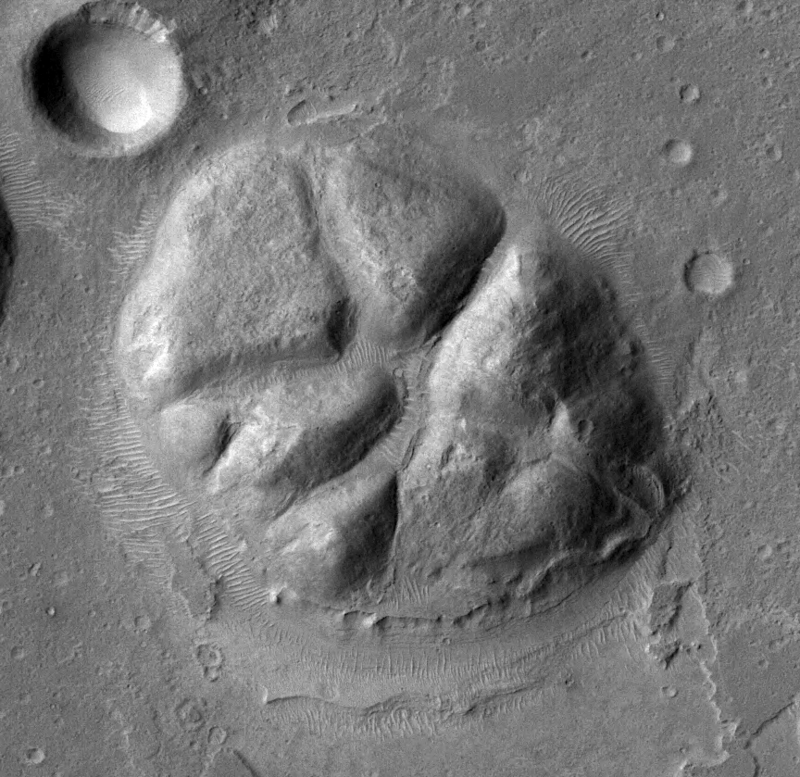 Whatever its origin, the close-up view at right shows that wind-blown sand has gathered in ripples within its fissures, and its surface is young enough to have collected only a couple of small craters. No matter where MSL is targeted, it won't land here — nor is this a likely site for any other rover on mission planners' drawing boards. But Hypanis Valles isn't going anywhere. One of the great things about Mars is that big changes come to the Red Planet only slowly. There's much to see and explore there and loads of time in which to do it. 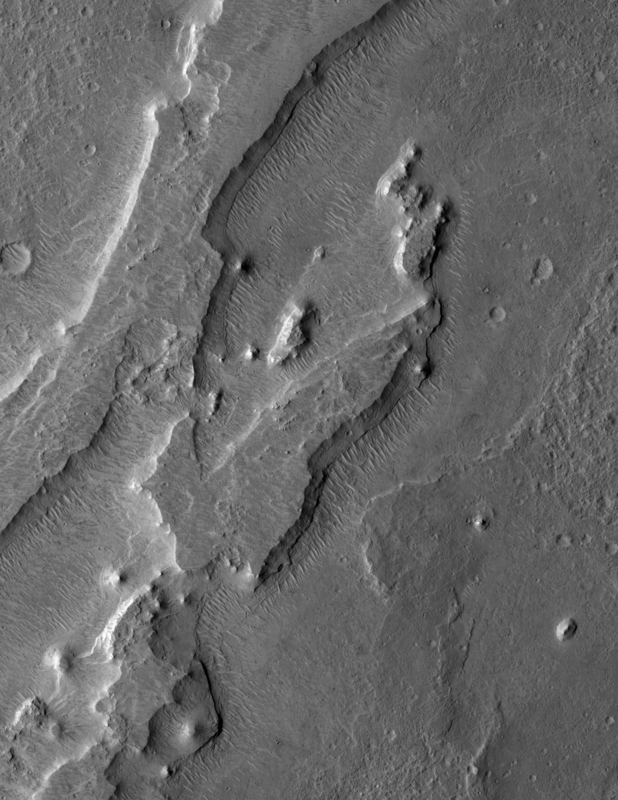 Hypanis Valles cut a winding channel as it flowed across generally flat terrain toward the northern lowlands. This image, about 15 km wide, is part of THEMIS VIS frame V27172034. 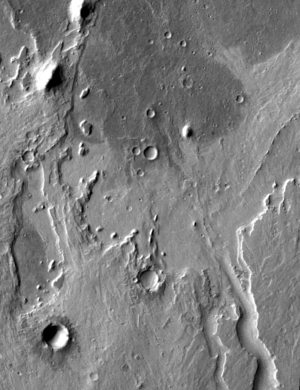 Part of the Hypanis channel has carved into a light-toned layer of seidments, apparently washing them a gentle slope to the north (upward in the image). This view, 12 km wide, is part of THEMIS VIS image V11585009. A close look at the mesa reveals that it is made from many sheets of thin sediments piled smoothly on top of each other. These may be windblown dust or volcanic ash — or possibly sediments deposited by water. This image, 5 km wide, is part of image PSP_010817_1920 taken by the HiRISE camera on Mars Reconnaissance Orbiter. The origin of this feature is not known for certain, but it resembles Arctic features on Earth called pingos. A pingo develops when ice lifts part of the ground, making a giant frost heave. This image, about 4 km wide, is part of image P15_007033_1915_XI_11N045W taken by the Context Imager (CTX) on the Mars Reconnaissance Orbiter.